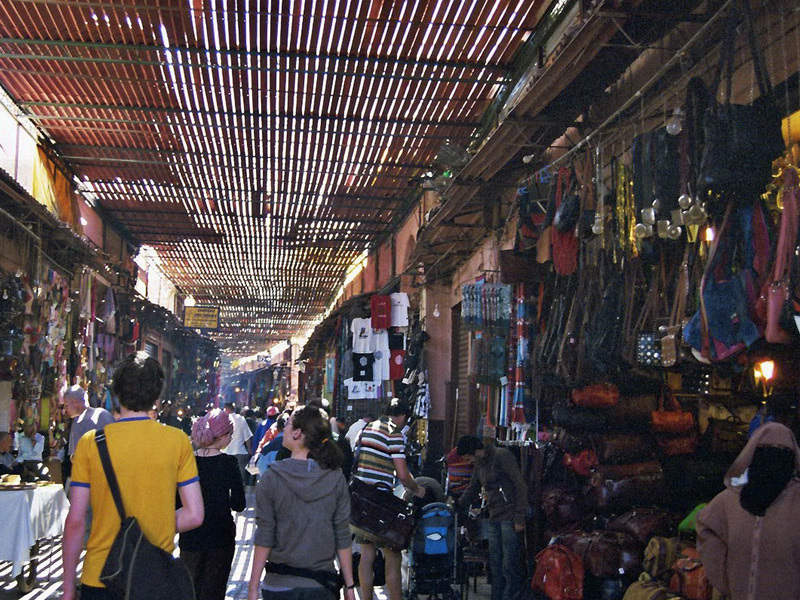 Marrakech is the second eldest of Morocco’s imperial cities. With a multitude of magnificent buildings erected on their order, the changing dynasties left distinct marks of their rule in the “Red City”. Today, the Medina of Marrakech is regarded as one of the biggest and most beautiful in Morocco. Pompous palaces, graceful mosques, and stately riads are hidden in the maze of the old city; they turn every stroll into an expedition to the Orient. 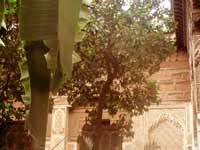 In the following, you can find a description of some of Marrakech’s most important sights. 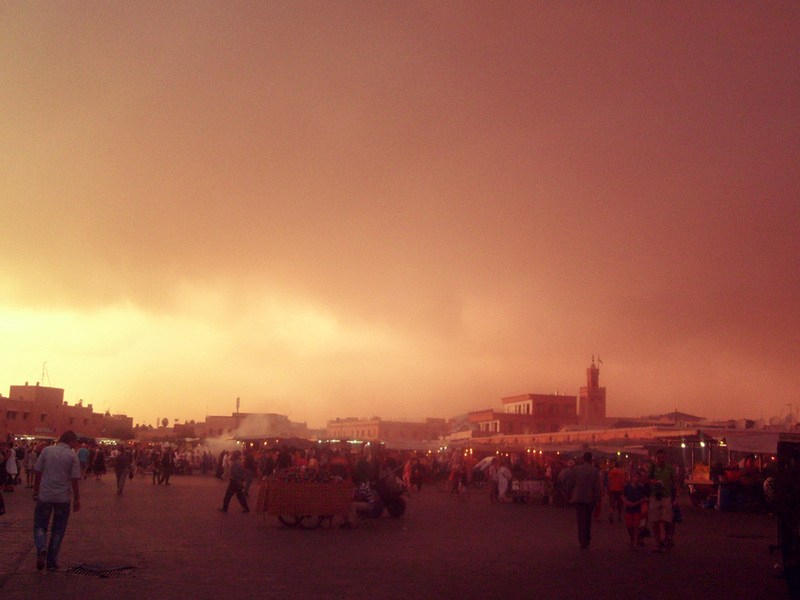 Right in the center of the Medina, there is the most famous and impressive place of Marrakech: the Jamaa el Fna. Phantasies of the Orient come true on the “assembly of the dead” where you will find snake-charmers, story-tellers, acrobats, and performers. In the evenings, Marrakech’s main square – declared a “World Heritage site” by UNESCO in 2001 – is enwrapped in the aromas rising up from the countless makeshift food stalls. 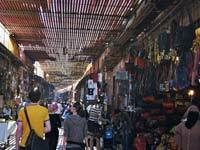 Located north of Djemma el Fna, the souqs of Marrakech are among the biggest in the country. The labyrinth of narrow streets, thoroughfares, and vaults can be experienced best on a stroll through the oriental bazaars. The diversity of the merchandise offered there is overwhelming. The souqs are divided into zones by trade: tinkerers, copper-smiths, wool dyers, wood carvers, carpenters, or spice traders – each having their own area. While passing through the bustling markets, one can also watch the manufacturers at work in their workshops. The souqs are a must-see – especially for shopping-aficionados! 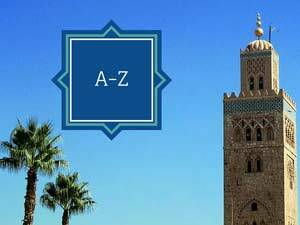 With a height of 77 meters, Koutoubia Mosque is a landmark of Marrakech that can be seen from far away. It was built in the 12th century by the Almohads and can accommodate 25.000 faithful. 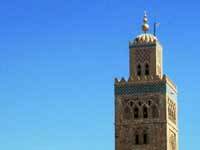 The Koutoubia minaret is one of the most beautiful in Morocco, and among the oldest. Minarets in all Maghreb have been built in its style. Koutoubia Mosque is located close to the Djemma el Fna in the southeastern part of the Medina and surrounded by a palm garden. 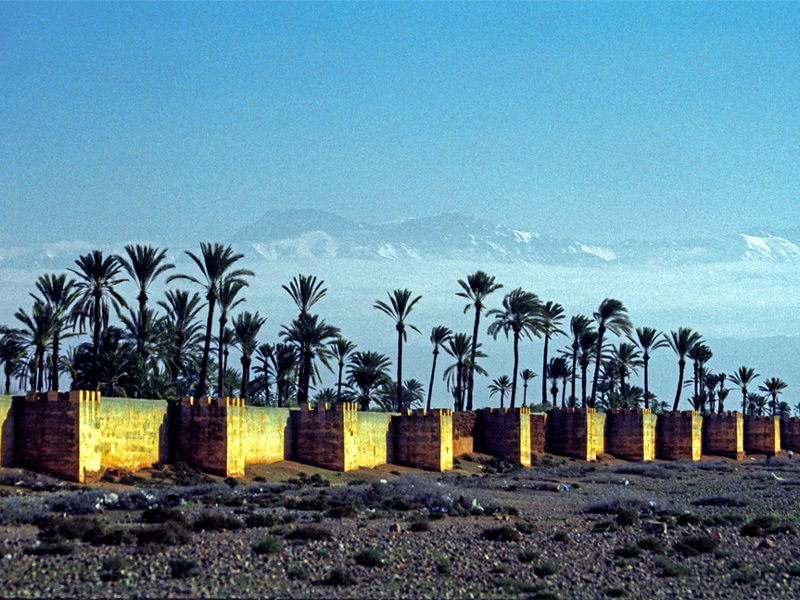 With an overall length of 12 km, this wall from the 12th century is one of the most impressive city walls in Morocco. It is towered by cypresses, date palms, and pines. More than 200 bastions reinforce the structure. Bab Agnaoua, located south of Djemaa el Fna, is regarded as the most beautiful of the wall’s eleven gates. 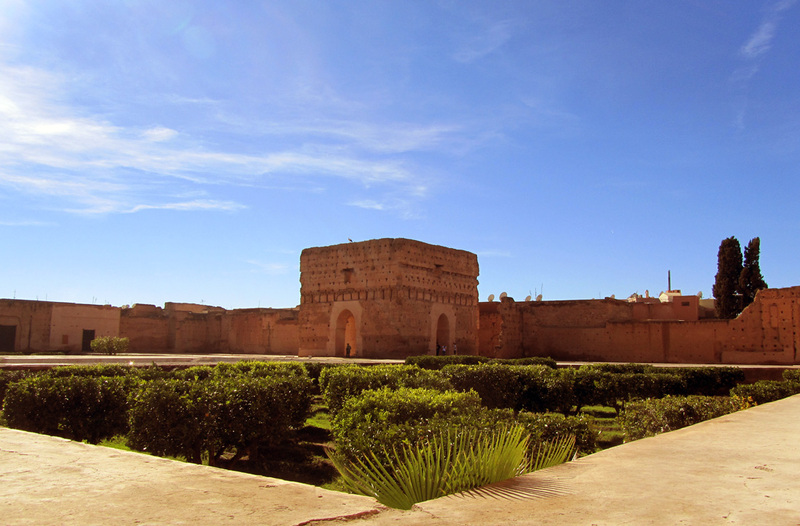 Founded in the 14th century, Ali Ben Youssef Madrasa was once the biggest Quranic college in the Maghreb. It could accommodate 900 students who lived and studied law and theology there. 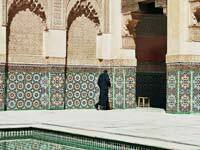 Today, the Madrasa — which has been expensively reconstructed during the last years — is one of the most popular destinations in Marrakech. The delicate stuccowork and carvings as well as the wonderful mosaics make the Madrasa an impressive display of Islamic architecture. The Bahia Palace has been built in the second half of the 19th century by the Alaouites; it is one of the most prominent buildings in the Moorish-Andalusian style. The monumental complex covers 8000 m² and consists of more than 160 rooms and court yards. It is a fine example of the grand opulence of Islamic architecture. 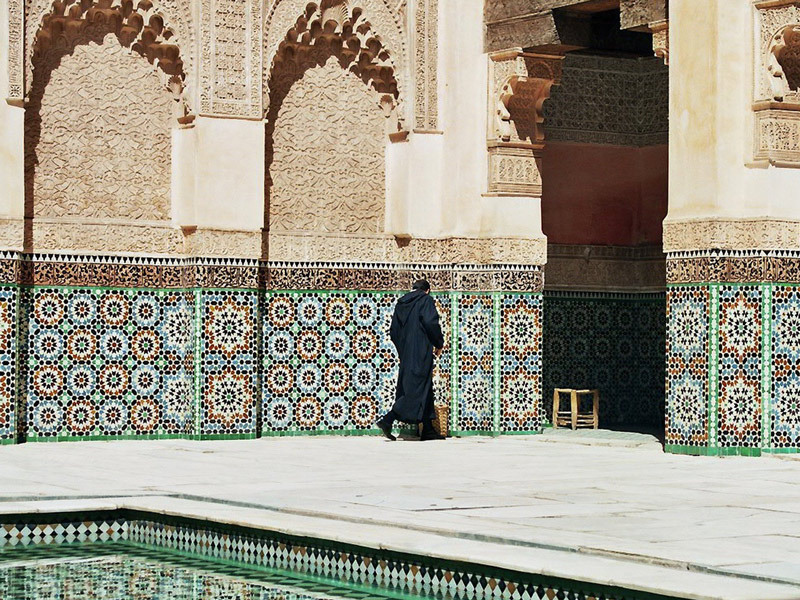 There are picturesque patios, wonderful mosaics, and arabesques. The artfully decorated ceilings made of cedarwood are also impressive. Bahia Palace has also been the scene for many movie productions, such as “Lion of the desert” or “Lawrence of Arabia”. 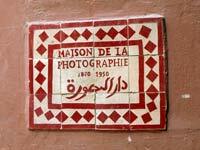 The Maison de la Photographie is located in a renovated Riad in the northern part of the Medina, close to Ali ben Youssef Madrasa. A collection of 8000 photographs made between 1870 and 1950 in the photo museum provides the material for the changing photo exhibitions that take you back into the past of Morocco. 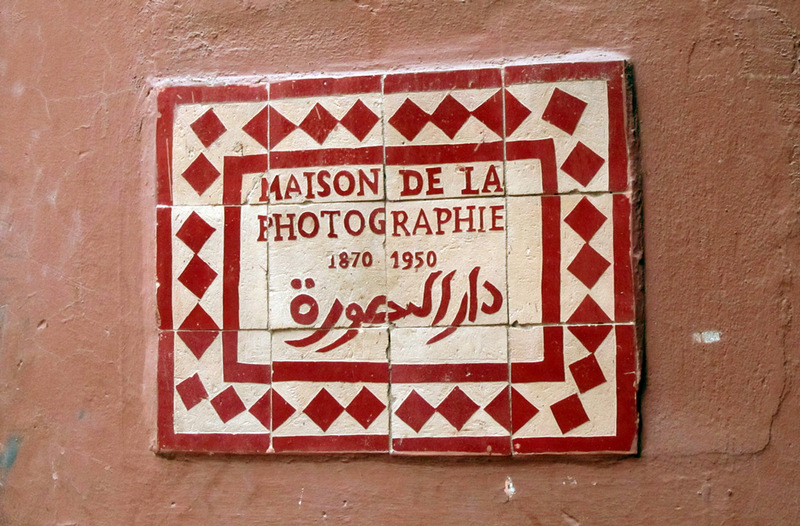 In addition, the museum presents younger works of Moroccan photo art. 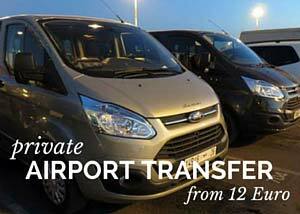 Thus, it is an attractive retreat for people who want to avoid the crowds of tourists. Today, all that is left of Badi Palace are monumental clay walls where storks build their nests. Nevertheless, you can still perceive that Sultan Ahmed el-Mansour, “the Incomparable”, lived up to his name when he ordered the construction of this magnificent building. It took 30 years to build the palace, but el-Mansour died before it was finished. Later, Sultan Moulay Ismail of the Alouites decreed that especially precious pieces of the palace be stripped and moved to Meknes. The ideal time to relish the vast extent of the 18 hectare areal are late afternoons when the sun lights the remains of the palace most beautifully. 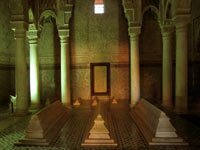 You find the Saadian Tombs right next to Badi Palace in the southeast of Marrakech’s Medina. Four sultans are entombed here in mausoleums that are rightfully counted among the most gorgeous buildings ever constructed by Moroccan artisans. The “Chamber of the 12 pillars” – a room in one of the two mausoleums – is really impressive: Twelve pillars made of Carrara marble carry honeycomb archways gilded with pure gold. 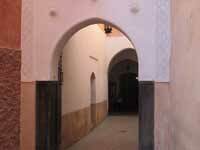 The folkloristic museum Dar Si Said is located in a stately Riad in the southern part of the Medina. It showcases traditional everyday items, handicraft, jewelry, and weapons produced in the region. In the back of the building, one can see centuries-old gates from Kasbahs in the Drâa Valley. These gates are made of cedarwood and decorated with ornate arabesques. The museum is definitely worth a visit – not least because of the palace with the grand courtyard where it is located. 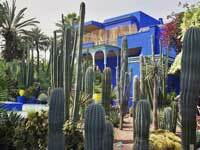 The wondrous Jardin Majorelle is just the right spot for taking a break from the bustling life in Marrakech. The French couturiere Yves Saint Laurent and his partner Pierre Bergère bought the overgrown garden in 1980 and turned it into a paradise maintained today by more than twenty employees. 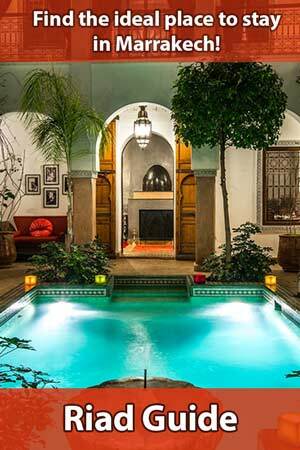 Visitors can access many parts of this green oasis of tranquility and relax from the heat of Marrakech. The Agdal Gardens have been laid out in the 12th century by the Almohads. Like the Menara Gardens, they have been declared “World Heritage Site” by the UNESCO. However, with a length of 3 km and a width of 1.5 km the area covered by the pomegranate, orange, and olive trees that are planted there in a geometric pattern is much bigger. In the park, there are two water reservoirs that are fed with fresh water from the mountains of the High Atlas by a sophisticated irrigation system. Close to the bigger reservoir, there is a palace with a terrace providing an excellent view over the gardens to the peaks of the High Atlas Mountains. 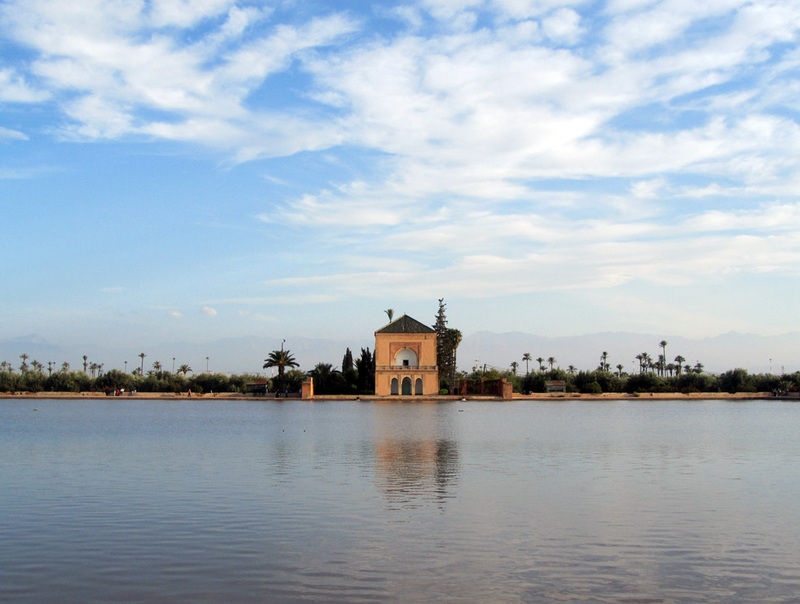 The Menara Gardens — located in the southeastern part of Marrakech — are popular especially among the local population. 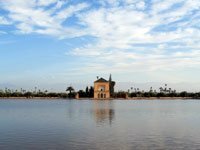 Laid out in the 12th century as an olive plantation by the Almohads, the 100 hectare sized park is irrigated by a wide canal system. Today, the garden is a “World Heritage Site”. 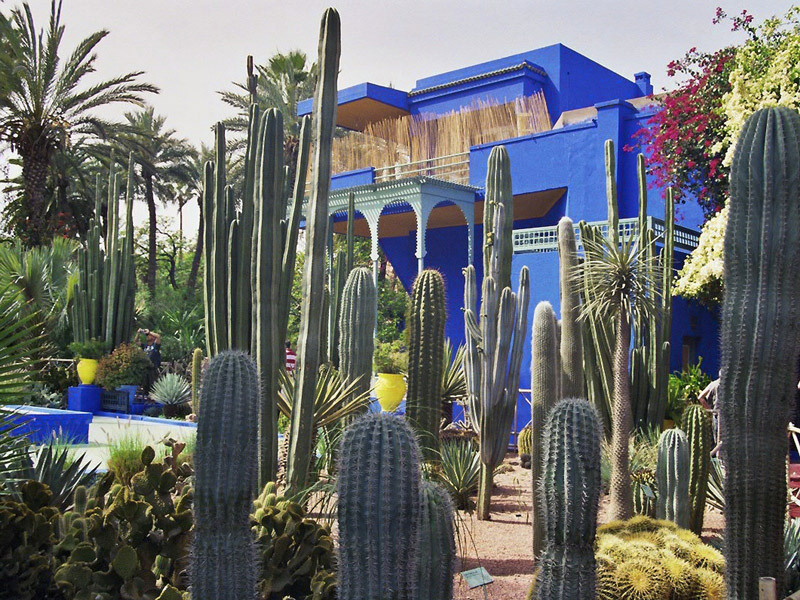 At first glance, the garden may not be as spectacular as the Jardin Majorelle; however, the entrance is free, and there are considerably fewer tourists. 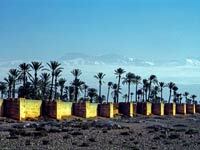 The palace between the water reservoirs and the snow-covered summits of the High Atlas Mountains is one of the most popular photo motifs in Marrakech.